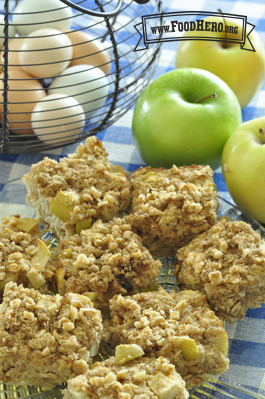 10 Comments for "Apple Spice Baked Oatmeal"
Which kind of apple's would be best to use ? Use almost any apple. Some are more sweet while others are described as tart. Red Delicious are best for eating fresh but almost any other variety can be used in cooking. I replaced the oil with peanut butter and it came out great. The grandkids spread a little extra peanut butter on top as well. This was a great breakfast with a banana on the side. I put this in muffin tins. It made 12. I also sprinkled sunflower seeds on top. This is an excellent recipe. The aroma while baking is outstanding! I used the amounts in the original recipe and it turned out great! Cooked it Sunday evening and refrigerated overnight, then cut into squares and reheated in the morning for breakfast. Will definitely make this again! One of my favorite recipes -- it smells GREAT when baking. Everyone in the house came sniffing though the kitchen asking, "Whatcha making?" wondering when it would be done. I've subbed in fresh blueberries and raspberries instead of the chopped apple and wasn't disappointed. Great recipe made as is, everyone ate it up! When we ate it the first day out of the oven it was softer than the next day leftovers but both were great! I liked the softer, right out of the oven more but just my taste. I think the recipe is great as is and wouldn't change any ratios! I used the amount of milk in the recipe, but added 1/3 cup more oatmeal, consistancy came out fine. Could almost cut into squares after putting in the fridge, then can re-heat. I also left off the nuts (was making this at home to try for a classroom tasting), and just mixed in the brown sugar instead of broiling it on top. My husband liked it, but thought it could be sweeter! I used unsweetened applesauce, so if you used the sweet kind that might make a difference, it wasn't specificed in the recipe what type to use. Think it would work well in a classroom situation. Great to make the night before for quick breakfast the next morning! It was great re-heated with more milk poured on top. I'll suggest using less milk. Thanks so much for your input. Changing the amount of milk will make changes in the texture. Can you give us more of your thoughts about why you suggest less milk and how much less? It will help others adapt the recipe.